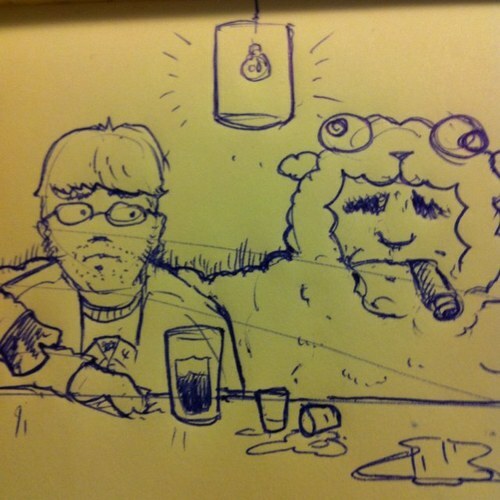 portrait of the idiot savant next to a sheep man by a talented man. Hi. As an impressionable child that listened to too much Canadian music, I quickly found myself becoming the very modern model of a major modern idiot savant online. In doing that, I developed a taste for writing and production. Specifically in the whole film/digital/etc world. I've written a lot of words (Indiewire, Indiewire, ThePlaylist, Movieline, GreenCineDaily, HammerToNail, TheWrap, Nomad Wide Editions, FilmBuff, SUNFiltered, IFC, FWD), wrote some themed content (UGO/IGN, Esquire) and have carried T-Stands on set. I have done my fair share of U/I, ran the online production side for Current's Rotten Tomatoes Show and have a great story about baking cakes for Chris Matthews. I'm on the twitter, the super twitter and a few other places. Ask me about my Armond White impression.